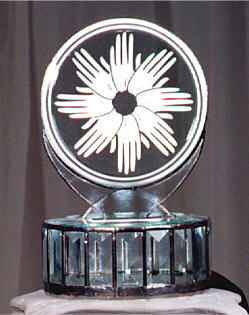 The first REM Award was presented in 1996. REM’s Arts and Entertainment Team conceived it as a regional award to be given to a person who exemplified the spirit of building community. The challenge of finding such an individual was very exciting. Only one such award would be given each year. The award would be given to someone who had consistently contributed to the community through leadership, volunteerism, optimism, and kindness of spirit. This last quality would distinguish the REM Award more than anything else. Many people offered their time and talents to help others, but only a few, special individuals also emitted a steady beacon of friendliness and compassion that warmed everyone they touched. Such a person was best described as having “a good heart,” or, to use a word imported from Yiddish, a mensch. The design of the award also needed to be unique. Norma Donovan and Ruth Nickerson, members of the Arts and Entertainment Team, helped to conceive the award as something elegant in glass. Taking the splendid logo design of Lisa Wheeler—the result of creative input from many REM members — Valerie Howard enlisted Jim Mercier, stained glass master at Waterville’s Glass Express, and Jeff McCaslin, a fine glass artisan and owner of the Bishop Crown Company in Winslow, to bring the design to brilliant life. Like its recipients, the REM Award would transform an everyday phenomenon—light—into a rainbow of prismatic possibilities. The award ceremony, too, would be very special. Modeled after the entertainment awards ceremonies that we see throughout the year on television, the finest performers from the region would come together to perform in tribute to the honoree. The reception following the ceremony would give people a chance to greet the honoree personally and bask in the communal good will that the ceremony generated. This yearly celebration would be a heart-warming evening for people of the region to gather in fellowship and share the spirit of REM, while contributing to the support of its programs. Beloved bandleader and Main Street mainstay Al Corey was the recipient of that first REM Award, followed by Winslow Fourth of July organizer Mary Morrison in 1997. The ceremony then took an unplanned three-year hiatus. Two consecutive honorees backed out at the last minute; and feeling discouraged, REM organizers chose not to select anyone the third year. In 2001, the ceremony was reborn, but with a new focus: instead of honoring a single individual, multiple awards were given, with each recipient representing a different non-profit organization. The participating organizations were members of the REM Partners, a newly formed coalition of Greater Waterville non-profits dedicated to promoting volunteerism and pooling their resources to solve community problems. Each organization chose one of its own volunteers to receive an award. Sixteen people were honored that year. 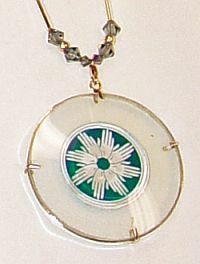 The new REM Awards crystal medallion can be worn as pendant on a handmade necklace. Alternatively, one who does not wish to wear his award can request a wooden display stand. The ceremony has been held annually since 2001 and has retained the same format, with multiple organizations each honoring one or more of their own volunteers. Nonetheless, REM does occasionally special awards to individuals whose contributions transcend any single nonprofit group. In 2003, REM presented a “Community Angel Award” to retired beverage distributor Walter Simcock for his philanthropy to numerous local organizations and a “Community Catalyst Award” to Empire Falls author Rick Russo for fostering an enhanced sense of community in Greater Waterville. Two years later, the awards committee presented a special, surprise award to Jim and Faye Nicholson for their many years of service to the community, and most recently, in 2014, posthumously honored Ryan Poirier, a longtime Meals on Wheels coordinator who had died a few months earlier. In 2006 REM found itself with more people to honor than awards. Eight past REM honorees gave up their awards so that the 2006 honorees would have them. A discussion arose: “You know, I spend lots of time dusting this thing and no one gets to see it. I’d like something I can wear so people will see it and ask me what it is and I can tell them I’m a REM award honoree.” REM ran with that. A local artist created a glass pendant and Faye Nicholson designed and made a variety of beaded necklaces to match. The eight old honorees were given new awards they could wear, and starting in 2007, new honorees could chose how to display their crystal awards. Each year the ceremony grows to meet the needs and creative ideas of the people who celebrate community service. Gregor Smith and Faye Nicholson adapted this history from an article by Val Howard that appeared in the 1997 awards program booklet. At the time, Val was the point person for REM’s Arts and Entertainment Team.